Pork chops require little preparation but they benefit greatly when marinated in a simple brining solution before grilling. Brining beforehand makes the meat more tender and juicy but it isn’t necessary. I dare say that most of us know how easy it is to overcook pork until it is as tasteless as a cardboard box and feels like you’re chewing on particle board. This extra step is worth it though – why settle for a mediocre pork chop, when you can have a great one! These succulent pork chops are covered in a garlic and herb sauce immediately after cooking. Have plenty of crusty bread on hand to sop up those glorious juices. BRINE THE PORK CHOPS: Using a medium bowl, stir together the water, sugar, and salt. Place the pork chops in gallon-size plastic food storage bag or a shallow baking dish, add the brine mixture. Refrigerate for 2 to 4 hours. Remove from brine 1 hour before cooking and bring meat to room temperature. MAKE THE GRILLING SAUCE: Using a mortar and pestle, mash together the parsley, salt, and garlic clove, until paste-like and no visible pieces of garlic remain. Stir in olive, oil, oregano, and red pepper. Season with fresh ground black pepper. Let sit several hours to allow the flavors to intensify. GRILL THE PORK CHOPS: Preheat grill to high heat. Remove the pork chops from brine. 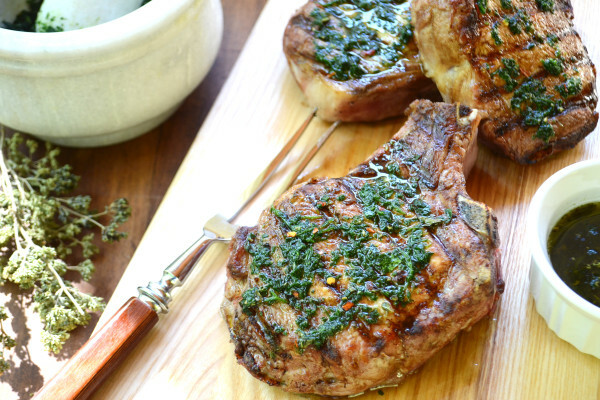 Reduce heat to medium and grill pork chops on both sides to an internal temperature of 135 degrees F. Remove from heat and transfer to a platter. Immediately spoon the grilling sauce over the pork chops. The safe temperature for pork is 145 degrees F. Let the pork chops sit for 10 minutes until it reaches 145 degrees F, the meat will continue to cook.